This month, we wanted to put forward one of the Louvre collection’s portraits, the Portrait of Mrs. Recamier painted by David. This canvas may look like a simple portrait of a woman but actually it has been a subject of deep dissensions between the painter and its model considering its indecent material. 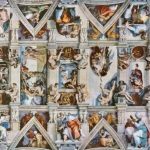 At the turn of the 19th century, a new form of art, inspired by the archaeological discoveries of Herculaneum and Pompeii, the Neo-classicism, takes shape in the workshops and parlors: rigor, righteousness and eloquence are its master words. Fashion, furniture and portraits are also following that new trend reinventing the ancient Rome. Jeanne Françoise Louise Adelaide Recamier (1777-1849), a rich banker’s wife, is one of the most famous socialites of her time. 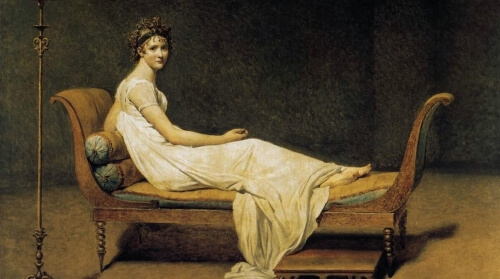 In 1800, she asks Jacques-Louis David to paint a portrait of her with a dress and a trendy haircut in an interior filed with antic furniture. As always, the master is working slowly, too slowly according to Mrs. Recamier’s, pushing her to regularly ask after her portrait. Losing patience after only a few months, she asks a former student of the master for another portrait of her. Outraged, David suddenly asks her to come and see her portrait in his workshop. Everything is as expected except for one little detail: she’s represented with bare feet. Today, such a way to depict someone would shock no one, but back then, only a woman of disrepute would appear like that. Outraged by this implied insult, Mrs. Recamier left her portrait to the painter who decided never to touch it again, not even for signing it. Portrait of Mrs. Recamier © The Yorck Project: 10.000 Meisterwerke der Malerei.